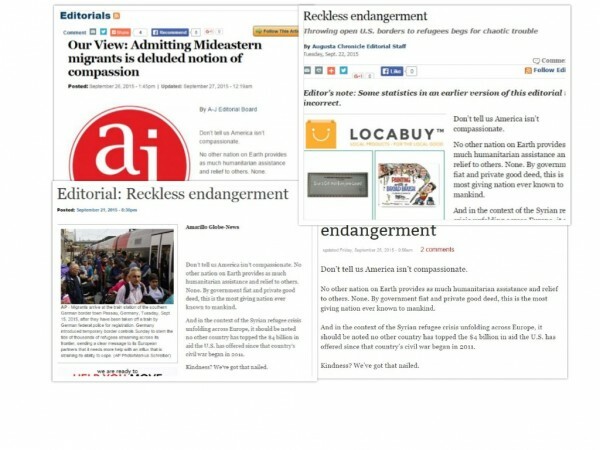 Last month, a Georgia-based media group with several papers and magazines in Alaska misled readers with a controversial editorial. In a leaked corporate memo, a vice president at Morris Communications told papers it owns–including the Juneau Empire and Peninsula Clarion–to run a pre-written editorial, and represent it as a local staff opinion. On October 14th, media blogger Jim Romenesko published a leaked corporate email from Morris Communications Company, which owns two dailies in Alaska, along with weeklies like the Chugiak-Eagle River Star, Homer News, and Alaska Journal of Commerce. The piece in question, titled “Reckless Endangerment,” argues the Obama Administration’s decision to raise the number of Syrian refugees admitted to the U.S. is “a potentially destructive act.” It was published in the Juneau Empire and Peninsula Clarion on September 24th. And though it gives the appearance of having been penned by local editors in either Juneau or Kenai, the words are exactly the same. Eleven daily newspapers across the country reprinted a controversial editorial, representing it as a local staff perspective. Nation-wide, 10 of 11 Morris’s daily papers printed the piece between September 21 and 26 (though titles varied somewhat). The only one that did not re-print it verbatim was the Florida Times-Union, which changed the prose and structure, but maintained the same argument, and cited nearly identical figures to make the case. Gilbert did not return multiple requests for comment. Nor did anybody else at Morris, although a receptionist for the senior vice president in charge of ethics violations said all questions must be directed to Mr. Morris, adding that she was not authorized to give out his contact information. Of the many Morris employees, both current and former, contacted for this story, all but one said they were unwilling or unable to speak on record about the company. Peninsula Clarion news editor Will Morrow said the corporate memo was an extremely rare case, but characterized running it as a “straightforward” decision case that did not receive much discussion. Asked whether he thought the paper had misled its readers, Morrow said he would not comment. Morris Communications has used local editorial pages to make a political point in the past. In 2013, William S. Morris III wrote an op-ed calling for a set-net ban right as all of the company’s Alaska-based papers started running a five-part series on salmon stocks. In that case, however, the author was clearly identified by the byline. Morris Communications is a privately held media company, and it’s their legal right to publish this kind of editorial. But to do so while passing it off as a local opinion piece strongly runs against the grain of journalism ethics.